Just got the 07 a little over a week ago and I've already started upgrades. First was the Akra Carbon and Creese tail tidy (not installed yet). I'm thinking an OES slider kit and shorty levers are in order next! I've previously ridden an R6 and Honda Shadow. I love everything about this bike! Born and raised in Midland and I live in Big Rapids now. Congrats on the purchase! Always great to see another Michigan owner! Ive got a few high school friends that live in Ann arbor, and a couple in Grand rapids. In the summer MI has beautiful riding weather but in winter...frack me is it cold. welcome dude Ive got a few high school friends that live in Ann arbor, and a couple in Grand rapids. I'm itching to get out of here and head south simply so I can ride more! Either Chesapeake Bay, Virginia or Outer Banks, NC area if everything works out the way I'd like. The job search is the only thing holding me back. Welcome castanzarules! Sweet lookin" bike! Thanks for joining us, its great to have you on board! Post some pics! That Akra Carbon looks sweet, welcome and congrats! Congrats and welcome! 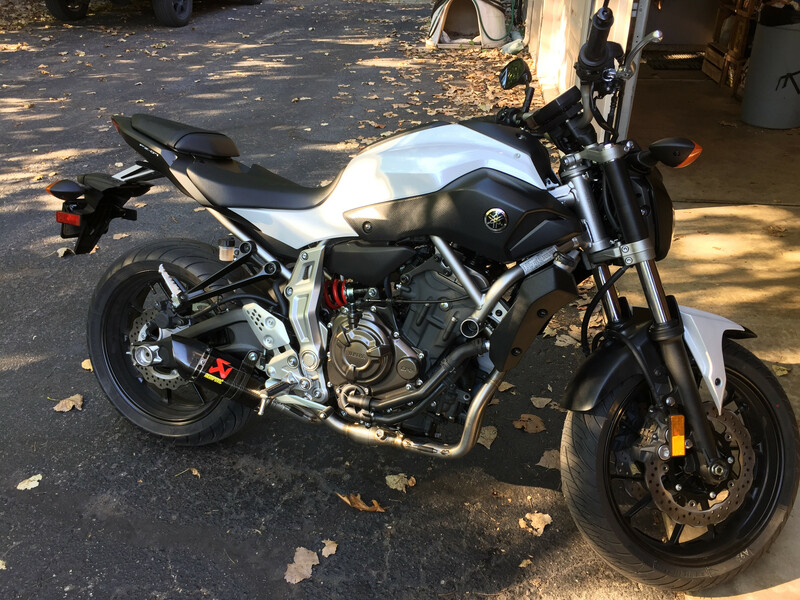 I'm thinking about getting the Akra Carbon exhaust for my FZ-07, it looks great!